NASA satellite instruments have observed a marked increase in the amount of solar radiation absorbed by the Arctic since the year 2000, a trend that aligns with the steady decrease in Arctic sea ice during the same period. While sea ice is mostly white and reflects sunlight, ocean water is darker and absorbs more of the Sun’s energy. A decline in Arctic albedo (reflectivity) has been a key concern among scientists since summer Arctic sea ice cover began shrinking in recent decades. As more solar energy is absorbed by the ocean, air, and icy land masses, it enhances the ongoing warming in the region, which is more pronounced than anywhere else on the planet. 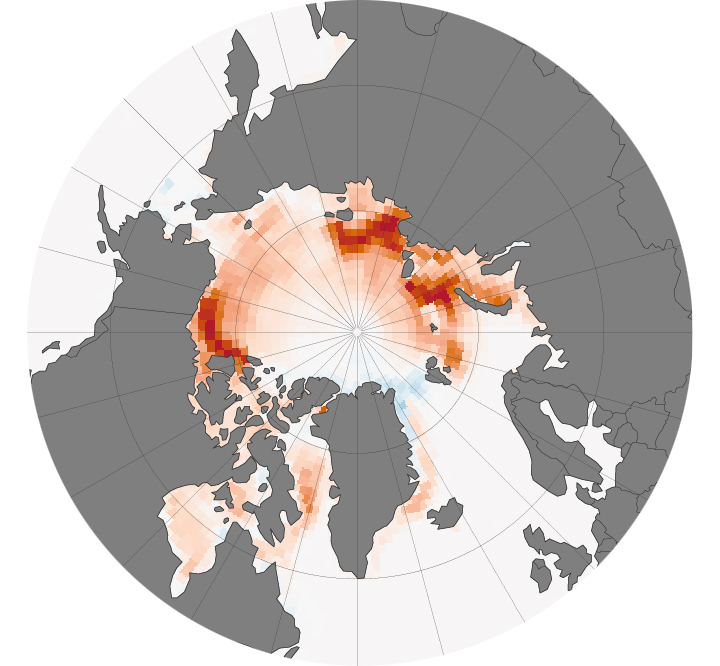 The maps above show the net change in solar radiation absorbed by the atmosphere over the Arctic from 2000 to 2014, as well as the net change in sea ice cover over the same period. Shades of red depict areas absorbing more sunlight (top map) and areas with less ice cover (second map). The radiation measurements were made by NASA’s Clouds and the Earth’s Radiant Energy System (CERES) instruments, which fly on multiple satellites. 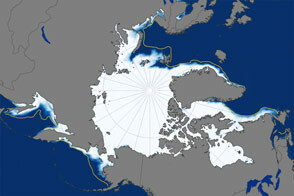 Measurements of sea ice cover were compiled from multiple satellite missions by the National Snow and Ice Data Center. Turn on the image comparison tool to see how increases in absorbed energy align with decreases in ice cover. Since the year 2000, the rate at which the Arctic absorbs solar radiation in June, July, and August has increased by 5 percent, said Norman Loeb, principal investigator for CERES and a climate scientist at NASA’s Langley Research Center. While a 5 percent increase might not seem like much, consider that the global rate has remained essentially flat during that same time. No other region on Earth shows a trend of change. When averaged over the entire Arctic Ocean, the increase in absorbed solar radiation is about 10 Watts per square meter. This is equivalent to an extra 10-watt light bulb shining continuously over every 10.76 square feet of Arctic Ocean for the entire summer. Regionally, the increase is even greater, Loeb noted. Areas such as the Beaufort Sea, which has experienced the some of the most pronounced decreases in sea-ice coverage, show a 50 watts per square meter increase. As a region, the Arctic is showing more dramatic signs of climate change than any other part of the planet. These include a warming of air temperatures at a rate two to three times greater than the rest of the planet, and the loss of September sea ice extent at a rate of 13 percent per decade. Increasing absorption of solar radiation is causing multiple changes in sea ice cover, said Walt Meier, a sea ice scientist from NASA’s Goddard Space Flight Center. Two of those changes include the timing of the melt season and the loss of older, thicker sea ice. Melt season in the high Arctic now starts an average of seven days earlier than in 1982, and earlier melting can lead to increased solar radiation absorption. And since 2000, the Arctic has lost 1.4 million square kilometers (541,000 square miles) of older, multi-year ice (more than 3 meters thick), which has essentially been replaced by ice that is less than 2 meters thick, according to data provided by Mark Tschudi at the University of Colorado. Both trends feed off of each other, Meier noted. CERES instruments are currently flying on the Terra, Aqua, and Suomi-NPP satellites. The instruments include three radiometers: one measuring solar radiation reflected by Earth (shortwave), one measuring thermal infrared radiation emitted by Earth (longwave), and one measuring all outgoing radiation, whether emitted or reflected. NASA Earth Observatory images by Jesse Allen based on data from Norman Loeb/CERES science team and the National Sniw and Ice Data Center. Adapted from a NASA news release written by Patrick Lynch. Satellites confirm that the Arctic has been absorbing more solar radiation over the past 15 years, a trend that coincides with a decline in sea ice and increase in open water. Loeb, N.G. et al. (2012) Observed changes in top-of-the-atmosphere radiation and upper-ocean heating consistent within uncertainty. Nature Geoscience, 5, 110Ã¢â¬â113. 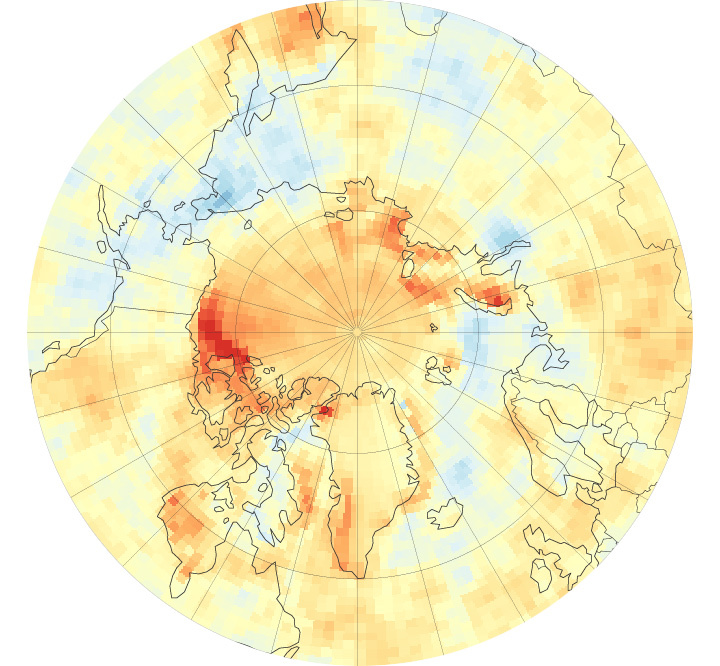 NASA (2014, February 18) NASA Satellites See Arctic Surface Darkening Faster. Accessed October 13, 2014. 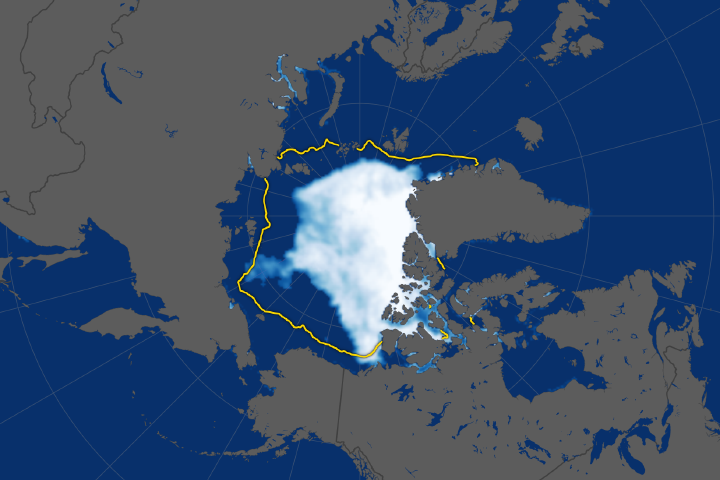 NASA Earth Observatory (2014) World of Change: Arctic Sea Ice. 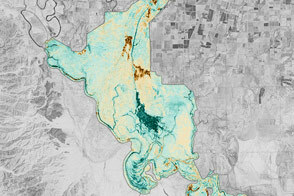 NASA Earth Observatory (2014, October 21) Measuring Earth’s Albedo. 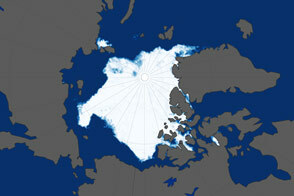 NASA Earth Observatory (2011, February 24) Melting Snow and Ice Warm Northern Hemisphere. NASA Earth Observatory (2009, January 14) Climate and Earth’s Energy Budget. 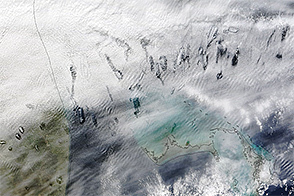 NASA Earth Observatory (2007, January 31) Arctic Reflection: Clouds Replace Snow and Ice as Solar Reflector. NASA Langley Research Center Clouds and the Earth’s Radiant Energy System (CERES). Accessed December 18, 2014. Stephens, G.L. et al. (2012) An update on Earth’s energy balance in light of the latest global observations. Nature Geoscience, 5, 691-696.